ELENKER Health Port Knee Walker provides a more reliable and comfortable alternative to crutches for patients needing an effective mobility solution at an affordable price. The steerable economy knee walker delivers one of the best kneewalker values in the industry and is ideal for for individuals recovering from a broken foot, broken ankle, broken leg, foot surgery, ankle surgery, leg amputation, other lower leg injuries or medical conditions like ulcers. Ideal for indoor and outdoor use, the steerable knee scooter walker features four smooth 8" PVC wheels. Overall Height w/ handlebar in lowest position: 33.46"
Overall Height w/ handlebar in highest position: 41.54"
Handlebar Adjusted Height Range: 33.46" - 41.54"
Cushion Adjusted Height Range: 19.29" - 23.23"
Cushion Area: 14.17" x 6.50" x 2.56"
Easy Help Recovery - Ideal for individuals recovering from injury or surgery to the foot, ankle or lower leg as well as below the knee amputees. Easily Moved to Anywhere - With our knee cart, your recovery won't slow you down or stop you from enjoying your day. You don't have to worry about not being able to get around, perfect for navigating your home, work, supermarket, park. Please note: don't slide at high speed for your safety. Recommended speed: 1m/s. Comfortable - Using crutches requires extensive upper body strength, rubs under your armpits and is unstable. This knee walker is made for both indoor and outdoor use, it is a hands free / pain free crutch alternative and offers the most versatility among knee walkers. Lightweight & Durable:This lightweight yet sturdy knee walker offers a robust weight capacity, making sure you feel comfortable, stable and safe - no matter where you are. 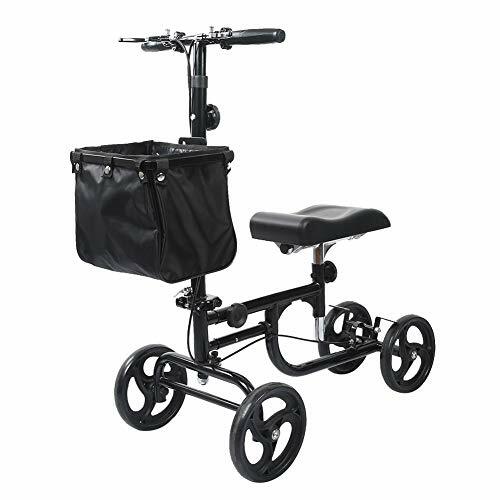 Adjustable and Compact: Steerable knee walker features handlebars with a quick release folding mechanism for easy transport and storage.